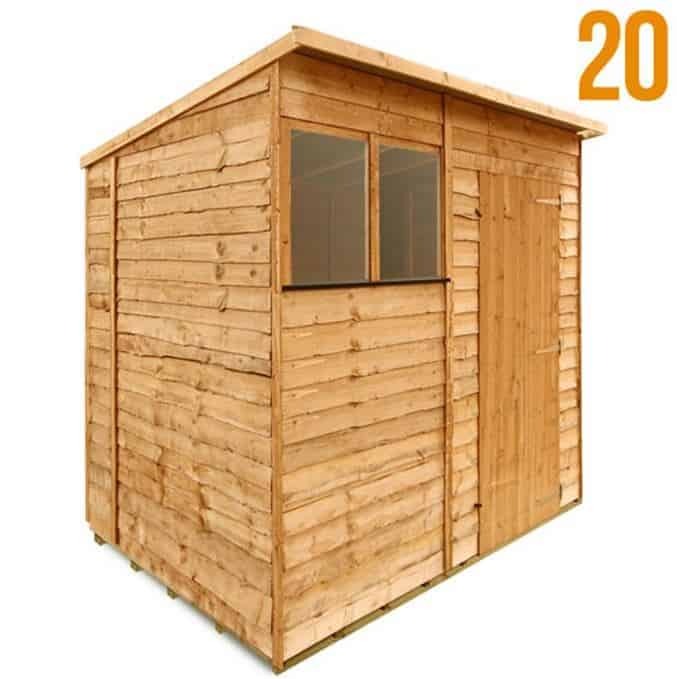 A great little entry level shed, it has pre-treatment for the cladding,which we think makes it a real bargain. There are two good windows and some excellent customisation options that don’t add too much to the price either. 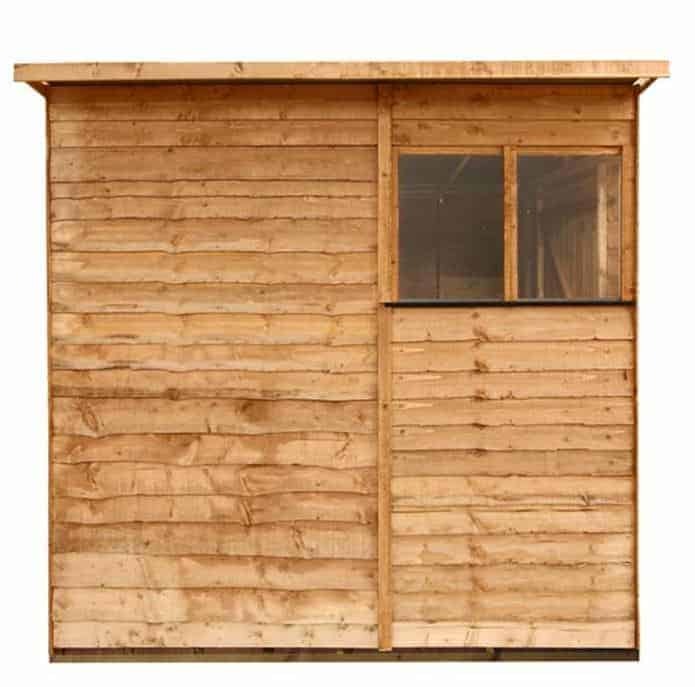 This is a windowless storage shed that has a pent roof. The measurements are 208 cm in width (which reduces to 205.2 cm internally) and 172 cm in depth (which reduces further to 151.2 cm internally). The pent roof does a great job of reducing the impact of rainwater by allowing it to flow off the roof quicker. 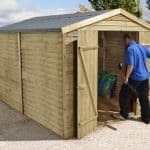 This means a better level of rain protection on top of the other key aspect of pent roofs, the potential for greater headroom that they provide. So you get a lot of value here. Perhaps due to the budget on the building, there is only sand felt supplied as roof covering.This is capable stuff, but will need replacing over time. The cladding is waney edge overlap. 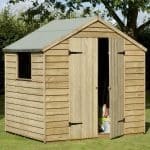 This gives it a really delightful appearance and that rustic impact that you would expect from a traditional shed. But there is a catch here. 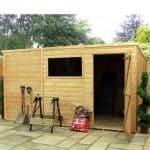 It is essential that the shed is treated, because the waney edge material is not the most durable over time. The timber has literally been cut straight from a tree and fixed to the structure of the building,and this needs to be taken into account. To get the best out of the cladding, it must be tested. And even then you are looking at cladding that is perhaps the lowest grade. This is obviously reflected in the price of the unit. The floor is a different matter as long as you are prepared to pay. 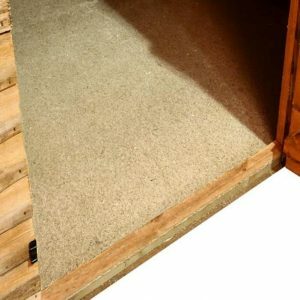 You can do without one and simply supply your own, or opt for the solid sheet material floor that the company can supply for a cost of £35. We reckon you should take the better route here and plump for the tongue and groove fitted floor. This is very strong stuff, and should provide you with flooring that will last for a very long time. It simply locks together and has great weight and solidity. And it only costs £48 extra. Great news here (and a real surprise considering the cost of the building). There is a pretreatment supplied at the factory that should give you years of great quality in the timber. This means that waney edge is not as much of a problem as it first was, and you have no need to treat annually. We liked the windows. They were wider than we expected, and the styrene glazing allows for a much tougher prospect. 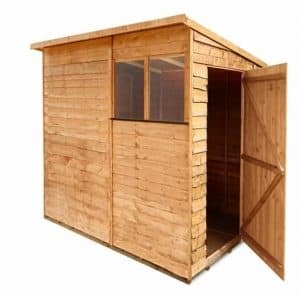 The door is solid, and opens up to 72.8 cm in width for access. 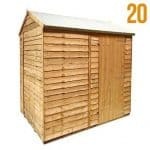 That’s plenty enough for the usage you will make of this simple storage shed. Styrene glazing helps, because the windows simply aren’t going to shatter at all. That cuts out the chances of entry. There is a simple turn button but that is pretty much cosmetic. Go for the padlock as an extra. There is plenty here to sink your teeth into. 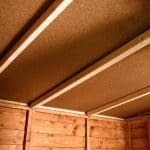 If you consider flooring as an option, you have that tongue and groove option that is really the only choice that is sensible. You can buy a padlock and protector that ramp up the security of the unit considerably, and we fully recommend this. They aren’t expensive, and they add massively to the safety aspect. You can also purchase some rather lovely shelving for the unit. 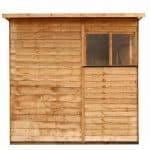 You can have shelving that runs up to 4ft in height, adding greatly to the overall utility. Finally, you can also add your own colour scheme through the trim and the walls using tubs you can pay for as extras. 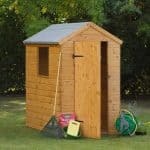 Final Thoughts: A good entry level storage shed, there are still some key features that make it a worthwhile purchase. Chief among these is the fact that the building is pre-treated, because waney edge can be a nightmare cladding over time. But the treatment takes care of that. We also like the windows, which are actually rather good quality for this price point. 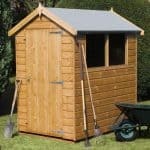 This is a good basic shed that should prove to be a valuable ally in your storage requirements. The only thing missing is decent roof covering.